I was inspired for this design (read: ripped off) from the box designed by my boss and buddy, Mauz from the band Kicker. He had originally built his own way back in his Dystopia days, but took the design to a fabricator in our building, Chris. 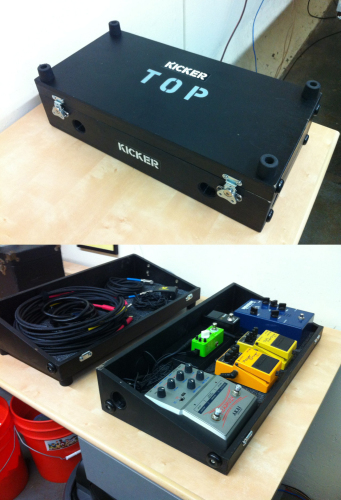 Together, they upped the ante and produced a very sweet pedal box. 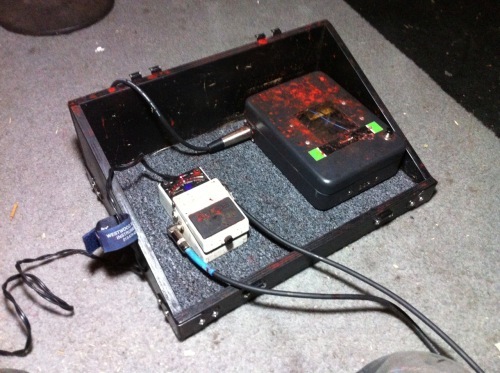 The angled slope of the box did a lot to keep stage divers’ feet from kicking the pedals around, as Mauz had a lot of problems with that in Dystopia. I suffer the same now. We also share variations of the same amplifier, the Ampeg V4. he measured his box so one side of the enclosure would fit perfectly on his amp. That inspired me. Our band uses wireless systems. For some reason, Sennheiser and all the makers of wireless systems decided that these boxes should be the most expensive and fragile thing you own. I was always worried about constantly taking my Sennheiser EW wireless apart while brusquely trying to exit the stage after a set. With this box set up, I could just have all my parts ready to go and well protected. I went to Chris and we set about to design a box more specific to my needs. I love to build things myself, but Chris had this down to make something way more durable and awesome than I could manage with a jigsaw and some spit. 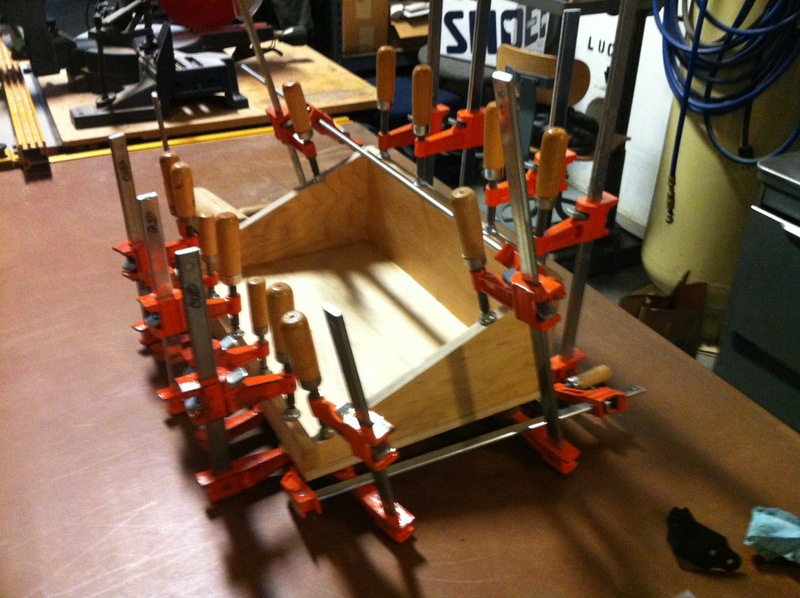 He built the box using biscuit joiners which makes it ultra tough and uses no unsightly screws. The dimensions fit the depth of my amplifier, but I made it taller so I could have two sides full of gear that I needed to have at the ready. 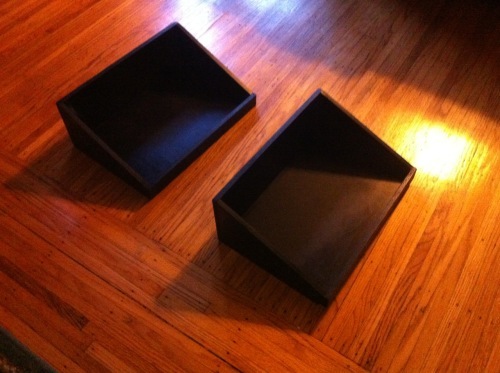 I glued some carpet remnants to the inside of my box halves. These act as the loop half of a hook and loop joining system (a.k.a. Velcro, you pedants). Hook tape on the bottom of my pedals and wireless would hold them in place. I used contact cement to attach carpet, but I wouldn’t recommend it. It stuck great, but the wet cement started peeling away at the paint. Instead, I’d recommend using 3M 77 spray adhesive. This half of the box lies at my feet. 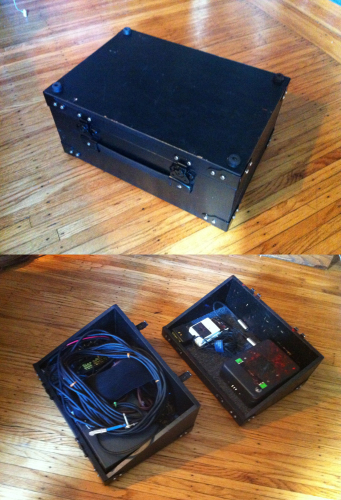 I’ve zip-tied two cords together that come from the amp side of the box and go through the tuner. I like to have my tuner easily accessible. There’s room for more pedals, possibly, but I’ve tried to simplify my set-up these days so I can focus more on my bass playing and fighting of Killbots. The iPod sampler I designed also needs to be in front of me. I bought a small XLR cable to keep attached to it to make it easier for house engineers to find and plug a line into. The other half of the box sits perfectly on top of my amp. It holds the stupidly fragile wireless receiver and the Sansamp Bass DI that acts as my overdrive as well as an active DI box. Again, I bought a short XLR cable to make it easier for house engineers to plug into my DI. 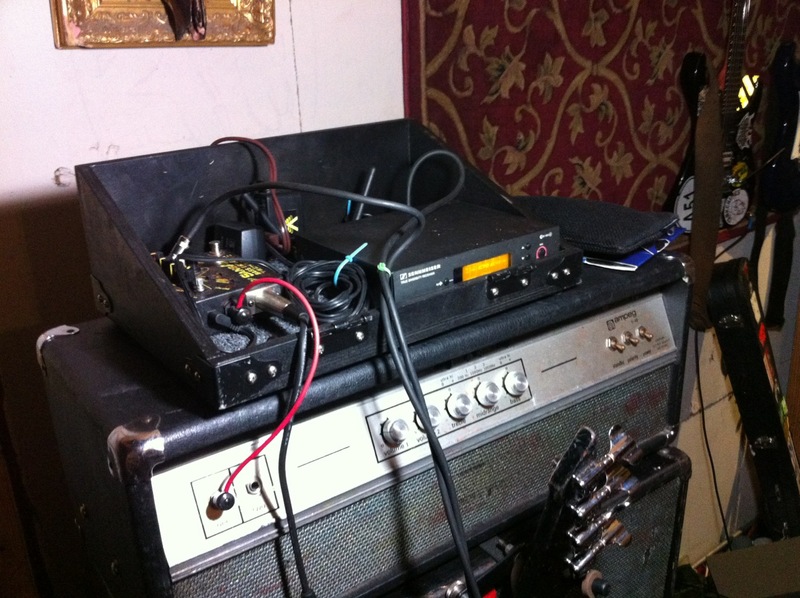 Both the wireless and DI power adapters are plugged into a short extension cord that I plug into the back of my amp. Easy peasy nice and squeezy. Beyond protection, another major point of this undertaking was speed. I had this made for our last tour because I knew that we had to exit stage quickly, like always, with the added obligation to clean up after our theatrics. I put lift-off hinges on the box so I could quickly pack it up. Everything fit inside in a quick and orderly fashion, including the speaker cable and the MD421 microphone I bring to mic my bass cabinet. This allowed me to run back out on stage quickly and mop up whatever blood remnants remained… sometimes with a handy towel, but more often than I would have liked, with the shirt off my back. I had Chris help me with the construction of the box, but I feel like any DIYer with a table saw could build something similar. 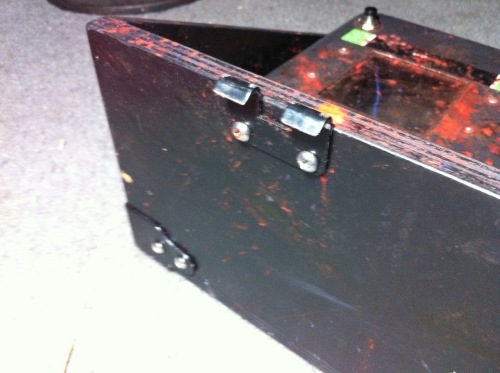 All of the hardware was brought from Reliable Hardware online, including latches, lift-off hinges, rubber feet, cabinet strap, and road case clamps. Even better, they have fulfillment available from Amazon, so if your order qualifies, you can score free shipping. It can take a some work and preparation to get a project like this built, but on stage it saved time and headaches. Don’t work hard, work smart! Hey what pedal is that little green one on the second picture?